Crushed peppermint candies make this a perfect holiday treat. Or use sprinkles to match your party theme and make it any time of the year. There are all different colors and types of sprinkles you can select from. You can use crushed candies, sugar crystals, shape or holiday sprinkles. Nuts can be used to if you know your guests are allergy free. Place candies in freezer ziplock bag and crush the candy using a rolling pin or heavy object. Use a chocolate melter if you have one. If you don't have one you can melt chocolate in microwave safe container. Since microwaves vary, you will have to adjust the time to your microwave. Start with 30 seconds, stir well with wooden spoon, add 15 seconds as needed. Heat until just melted. Chocolate should be warm not hot. Chocolate scorches very easily and will taste burnt if heated too long. Line a pan or container with parchment paper or waxed paper. Pour chocolate onto waxed paper to desired thickness. Sprinkle 1/2 the crushed candies over the chocolate layer. Refrigerate for 15 minutes. Melt white chocolate. Pour evenly over the dark layer of chocolate. 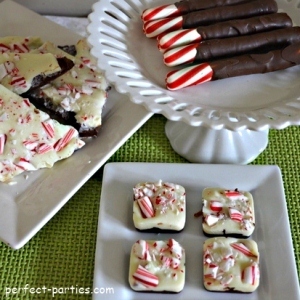 Sprinkle the rest of the peppermint candies and gently press the candies into the chocolate. Refrigerate until completely hardened. Remove from pan and break into pieces from the back. Using the Wilton Silicone Baking Mold makes cute squares and no need to break into pieces. Just pop them out of the silicone after it hardens. Peppermint extract can be added. Add 1/4 teaspoon to melted chocolate before pouring. We prefer it without it. 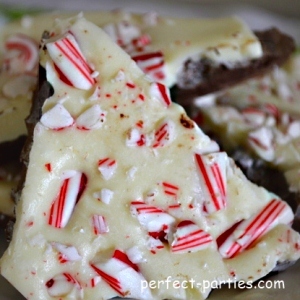 Break pieces from the back of the chocolate bark and less of the crushed peppermint will fall out. Use a clear Pyrex rectangular dish to pour chocolate into and you can easily see how high each layer is. This pot made this so much easier! I'd definitely recommend getting this Wilton Chocolate Melting Pot if you enjoy dipping pretzels, strawberries and make cake pops. The metal portion or the pot will get hot so adult needs to be constantly monitoring if children are helping. Extra chocolate? Dip other fruit such as blackberries, or even dried fruit like apricots. 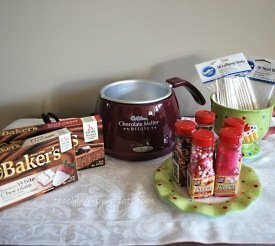 Dip the extra peppermint sticks or candies!